You can buy the Pi? I thought they made like 7 of them and then abandoned ship? That’s right, only seven exist. Take a close look at that post, all the pictures of the Raspberry Pi are closeups of one of those seven, currently in a non-disclosed location. The rest of the post and project is an elaborate hoax to make you think someone actually managed to get one of these devices. I’ve got 2, one from newark and the other from RS. Newark used a mailer and a chipboard box that just fit the board. RS has much better packaging with antistatic foam. Yea, I got mine on Monday and it looked it was run over. I have pictures on my blog if you click my name. I got it from Newark. I should get another one, these are so much fun. I have lighttpd with PHP and a PHP file manager running. That’s better than being ran over, but I guess we know now that they can survive being stepped on lol. So glad it wasn’t damaged, I would of had tears. I got two of them from Newark (Element14) which were in bags inside of boxes. And their shipping was sufficiently padded. Either way both units I received powered up with no issue and survived initial smoke tests. Would be all kids of awesome if I could find an XBMC build that was actually stable; or if someone would put out a debian build with a 2d accelerated xorg driver rather than the slow framebuffer one. Still, they work. w00t! I’m thinking the right way to fit it in a M100 or M102 is to unsolder the DB25, and put in a USB-RS232 connection on the raspberry pi, and usb ports out the back of the M100. The USB-RS232 connects to the 100’s RS232, and the pi has a getty running on that port. Then you still get the internal display of the 100. I would have liked to have seen that done. It would have kept both machines functional, but I don’t think you can stuff it all new parts into the original case without gutting the old hardware first. Hey, I have a couple of those (M100) I should do something like that! The M100’s display form factor is the only thing that has kept this from being done for real. I’m not sure chopping them up to use the keyboard is a very good idea, but to each their own. In fact, it’s an excellent enclosure for someone wanting to build a laptop style device, as the battery bay used very large cells and it could probably run a low power device for weeks. But I don’t think any modern LCD matches the old LCD’s measurements well enough to provide a drop in replacement. I’m guessing this guy might at well put the unit in a TI speak and spell. 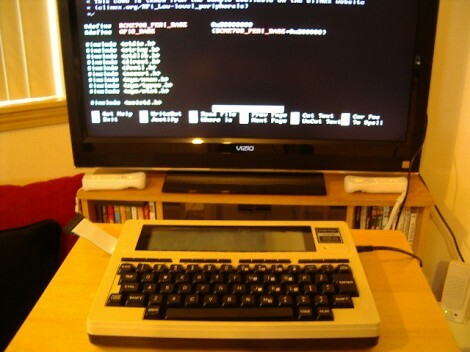 Someone should build an interface for one of those old 11″ laptop screens and make a PiPad. Ought to work, many of these old screens work fine if the equally antique CCFL is ripped out and replaced with LEDs. Some older digital picture frames used a VGA input screen without the e2prom memory, which should be useable with minimal modification. I picked up three Husky Hunter 2 units from a clear out of the basement at work, was gonna ebay them but may have to keep one, see if I can replace the guts with a Pi (already on order) and a WiFi dongle and use it as a remote terminal instead of my phone. Does anyone know if this is likely to be possible? Especially hooking up the Pi to the inbuilt display (40 x 8)? My hacker skills are limited but growing and I bought the Pi without a specific project in mind but this has piqued my interest. The enclosures for these units are virtually bombproof!